Photo courtesy of Holly Covey. I have a friend who entered a dressage show on the same day as cross country day at Fair Hill, and I was shocked. Who would do that? Then I realized; there is a whole ‘nother world out there that does not think Fair Hill International is the most important event on the planet. Geez. Who knew? It is said that the road to Kentucky goes down Gallaher Road. That’s for the competitors. I think for volunteers, our best time of the year also goes down Gallaher Road, too. My oldest volunteer pin is from 2002. That for sure puts me in at 16 straight years of living and dying on that piece of gorgeous land at the corner of Gallaher Road and Elk Chapel Road in northern Maryland, but I also go back a few years before that. We think that I have been helping with the cross country course about 20 years. Wow, that is hard to type. This year’s Fair Hill International renewal is now in its 30th year. While those of us who have come to know this event as our “home” international CCI feel like we have accomplished something, really, it’s not ours. It’s everyone’s. There are people I’ve never met at Fair Hill who have worked hard every year doing something you and I don’t know about, but they are there. Every year I volunteer, I meet someone for the first time and we swap war stories about how many years we’ve been doing it and the Monsoon Year and other fun memories. Not every job has been glamorous and gotten a photo on EN. Lots of jobs that go completely unheralded in putting on a great CCI and sporting event in the country are terribly difficult. There are trash people and parking people. There are people who cook food for the volunteers long before a horse arrives to feed us while we work desperately on setting up. There are people who just run around on gaters and golf carts doing whatever. I am very envious of those people! There are people who unhook their trucks from their horse trailers and go get cornstalks and mums and equipment and tables and chairs and set it all up. And have the time while doing their job to help others with questions, answer emails, make phone calls, straighten out problems and direct sponsors to their booth space. There are people who spend hours on the phone months in advance getting sponsors, collecting checks, doing bookwork, accounting, advertising, and other minute detailed paperwork involved in an international sporting event. These folks of course are all volunteers (most of them anyway) and love what they do. But they all have lives and kids and houses and jobs, too. And some have horses that still need feeding and stall cleaning and riding. At home. That other place you go to sleep and find clean clothes. While we as volunteers are delighted to return year after year, we also know the importance of bringing in others to help and learn the essential jobs. Creating a family and experience goes that way. We have fun, too, in the midst of all that work. We’ve learned that if we didn’t, it made it hard to justify the time and attention. We all look at each other on Tuesday and compare the energy levels — pretty darn low. Then … trailers with big logos come rumbling down Gallaher Road, horses start arriving, and riders start walking in, and trainers, and all the luminaries of the sport, and and we’re energized. They’re here! It’s starting! 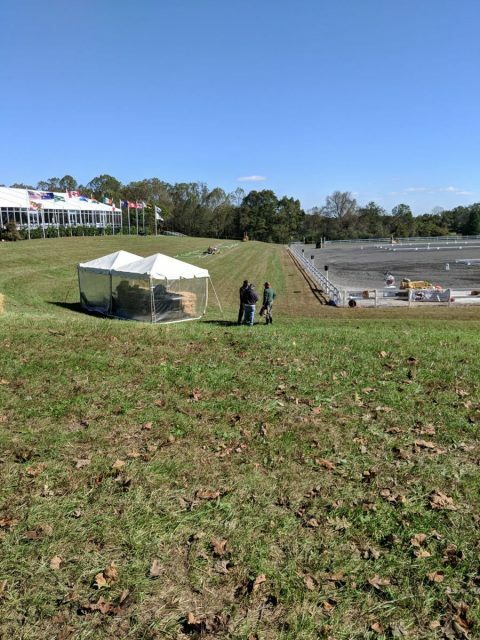 While we don’t know how things will work in the new location, scheduled for 2020, right now and for next year we will continue at the Gallaher Road location for the CCI2* and CCI3*. As the FEI changes and moves its rules and proposals forward, we as volunteers are at the lowest end of the food chain. We follow as ordered. But we are darn sure going to have a good time doing it! And our world, the third weekend in October, will always go down Gallaher Road and stop at a place we love to enjoy together. See you there!